Eying the premium 4G smartphone market in India, MediaTek has introduced its MT6595 true octa-core 4G LTE System on Chip (SoC) in India. Devices embedded with the new MT6595 are expected to arrive by the end of the year. The MT6595 was first announced in February and the global chip-maker is looking forward to partner with Indian smartphone manufacturers for upcoming 4G LTE smartphones in the country. “4G LTE smartphones will take time to go mainstream in India as 3G smartphones will continue to dominate. However, 4G LTE smartphones will start gaining momentum from next year,” said Finbarr Moynihan, General Manager- Corporate Sales International, MediaTek. MediaTek recently announced a new R&D facility in Bengaluru and invested US$200 million in the Indian market. “We will continue to expand our R&D facilities in India. 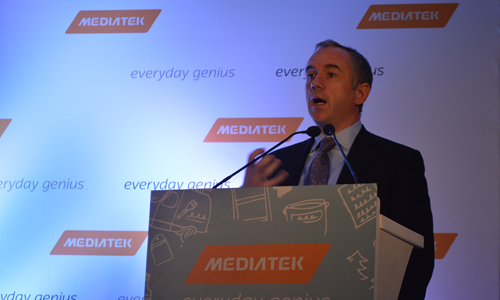 The new Bengaluru facility together with MediaTek’s Noida facilities will boost our R&D capability in the country,” said Moynihan.